The older I get, the more I find myself saying those cliché phrases I swore I’d never say. “These kids have no idea how easy they have it,” or “Music was so much better in my day,” are just two of the recent remarks that fell from my lips seconds before I slapped myself across the face in shame. Maybe it’s inevitable, as we age we yearn for the world to stay familiar and we struggle with the dynamics in an ever-morphing universe. Stuffy ceremonies like the Academy Awards are an annual reminder to me about the truth of a dying convention; the days when classy was the norm. Women didn’t leave the house without a hat, and men wore suits on the regular. The business casual we so desperately embrace in the work force today would have been borderline under-dressed in the household for dinnertime just a handful of decades ago. The youth of today see glitz and glam only during awards ceremonies, and really nowhere else. In recent years I have wondered if it would be impossible to bridge the gap between modern youth and the elegant observance of respectful customs like the Academy Awards. Last night, Ellen DeGeneres did it so masterfully, I can’t imagine anyone having done a better job. Even Bob Hope wouldn’t have been able to pull that off. 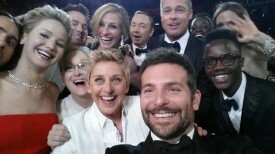 Tasteful and brilliant comedy coupled with a subdued-yet-still-elegant style, Ellen truly embraced those hours during the ceremony to show our youth how to properly (with all clothing intact) savor a moment in the spotlight when she took an impromptu “selfie” with other Hollywood stars and broke records on Twitter for the amount of re-tweets. In a stroke of genius, that very same act appealed to an older generation as well, showing Meryl Streep – a woman having enjoyed nearly 40 years of stardom – partaking in the silliness of snapping photos on the fly with the likes of Jennifer Lawrence. If only we could see Liza Minneli in that photo (she was in the back, but too short to be seen) that photo would transcend from epic to colossalegendary! 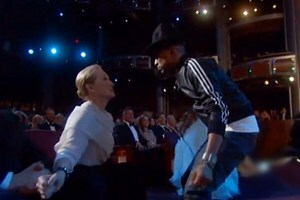 I also want to give credit to Pharrell Williams for getting Meryl Streep to shake it! He wasn’t just bridging the gap, he was forming an enchanting catwalk between young and old. Ellen DeGeneres knows how to make people laugh without trying too hard. She is, along with comedy greats like Billy Crystal, Johnny Carson, and Lucille Ball, able to permeate humor from her body in an effortless fashion. She could read the phone book and still make me laugh, because she would know exactly which syllables to emphasize. Ellen was the perfect choice to host the Oscars, and I certainly hope she does it again. Furthermore, future hosts should take a hint from the DeGeneres playbook and not try so hard to host with a shock-and-awe approach. Simple is better. Classy can still be young, and young can still be classy.